Inch by inch, day by day, Scott Carey is getting smaller. Once an unremarkable husband and father, Scott finds himself shrinking with no end in sight. His wife and family turn into unreachable giants, the family cat becomes a predatory menace, and Scott must struggle to survive in a world that seems to be growing ever larger and more perilous--until he faces the ultimate limits of fear and existence. 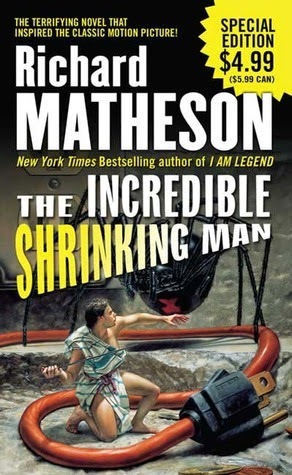 After reading about white male privilege, racial oppression, and gender inequality, I found it interesting that I chose to read a book about a man who is losing his height at nearly an inch per week. Not only is he greatly inconvenienced because he can't reach high shelves, he is also losing his power and significance as a man and a human being and reduced to merely survival. It’s an adventure tale, and it has some horror and sci-fi elements. I like how the story didn’t feel dated, despite being written in the 50’s. Scott Carey was not always a likable character, but he was believable and I felt his anguish over every inch he lost and the changing relationship with his wife and daughter, his encounter with bullies, a child molester, and a predatory black widow spider. The ending is sad and surprisingly hopeful. The Test - a story that explores how society deals with its aging population and one family’s moral quandary and emotional turmoil over an aging parent who must be tested to determine if he is fit to live. Sad, heartbreaking, and not entirely unrealistic. Mantage was about a writer who, after watching a movie with his wife, wishes he could fast-forward through the drudgery and struggles of his life in order to achieve success faster. Shoofly was about the battle between a harried businessman and the fly that lands in his office. There was so much tension in this story that I wasn’t sure who or what would die at the end. The ending was hilarious! Matheson is always a great read. I first discovered him when I realized he wrote some of my favorite Twilight Zone episodes. His longer novels are good, but it's short stories where he really excels.